Can you retire when you want to? What can you improve to retire? Guided wealth portfolio (GWP) is a sophisticated investment solution personalized for your specific stage in life, and will evolve with you as your life changes. You will experience streamlined set-up and account maintenance, with the added support of professional financial advisors. Take the steps to begin building your personalized financial road-map. Your Personalized portfolio is based on many factors, including your risk tolerance and age. The GWP will offer you services and account minimums that are not traditionally available. Customize your plan - Tell us about your investment horizon, risk tolerance, current investments and savings. Review our recommendations - connect your current accounts and the Guided Wealth Portfolios makes recommendations to potentially improve your investment accounts. Compare GWP's recommendations to your current holdings to begin building your road-map. This road map is free and remains available to you for 45 days. Make it work for you - if you decide to implement the GWP's plan, you will move one step closer to pursuing your financial goals. We will provide advice on your investments and continue to look for ways to minimize taxes. 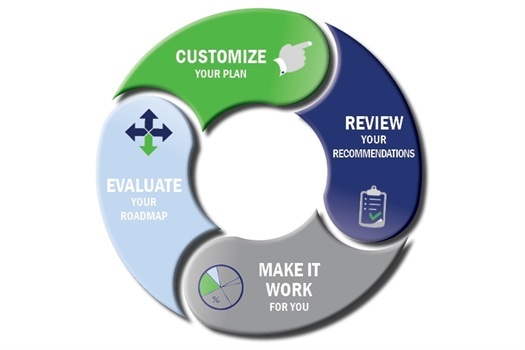 Evaluate your road-map - we will perform an annual evaluation of your performance to see if there are any areas that need adjustment.